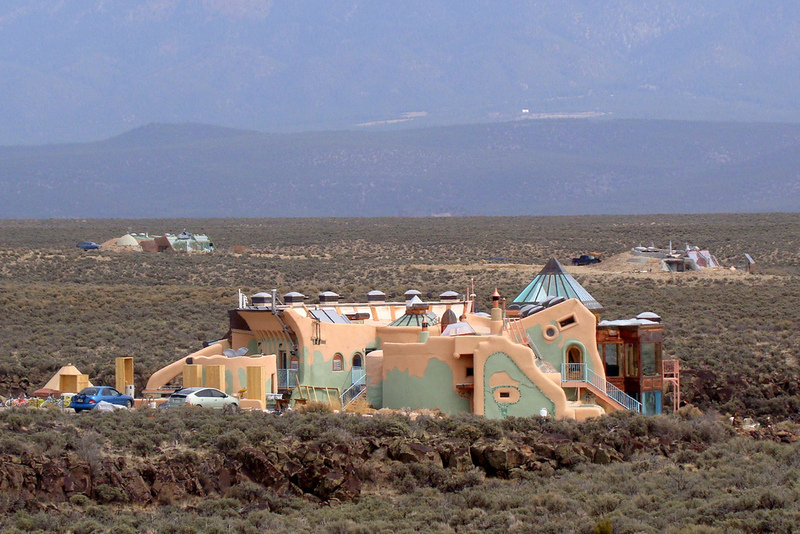 A mile west of the Rio Grande Gorge – just northwest of Taos, New Mexico – lies Earthship Way and the Greater World Community. This unassuming and slightly remote neighborhood is home to over 60 homes constructed in a rather unusual and eco-friendly fashion. Made from a variety of upcycled materials and designed for off-the-grid living, these homes – dubbed Earthships – are the brainchild of Mike Reynolds of Earthship Biotecture. 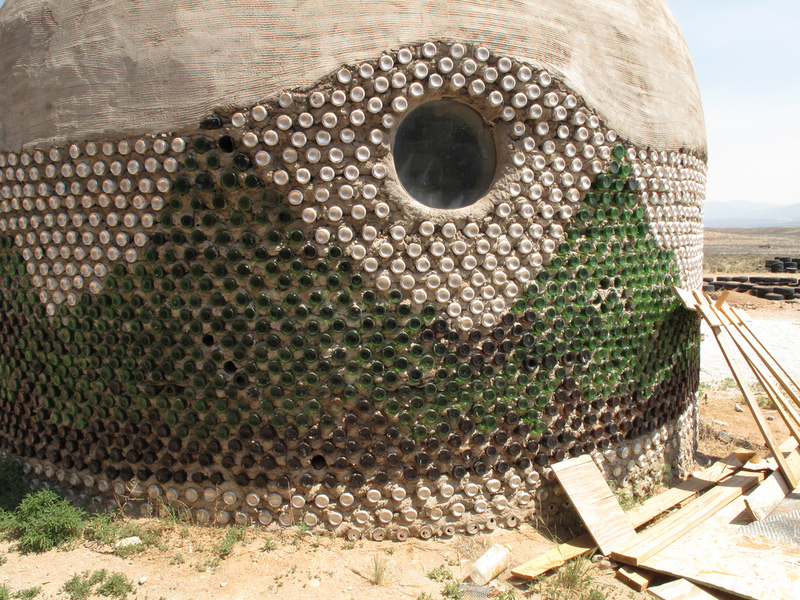 The first step to constructing an Earthship is erecting walls made of recycled tires packed tightly with earth. The tires are arranged in either circular or U-shaped sections for maximum structural stability and stacked in a staggered fashion like bricks. The tires walls are simple to make, but laborious; each tire is packed by a team of two workers, one to shovel dirt into the tire and the other to ram it with a sledgehammer. Properly packed, each tire weighs over 350 pounds. The weight makes them difficult to relocate, so each Earthship must be built on-site. 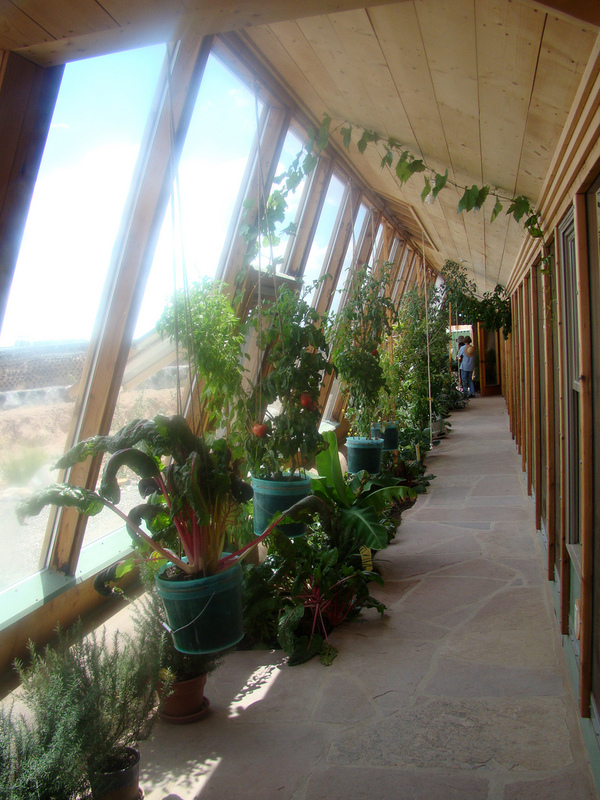 Earthships are designed with a south-facing wall of windows to take full advantage of solar thermal heat. The windows are angled to let in more of the low-angled winter sun and less of the summer sun that’s higher in the sky. 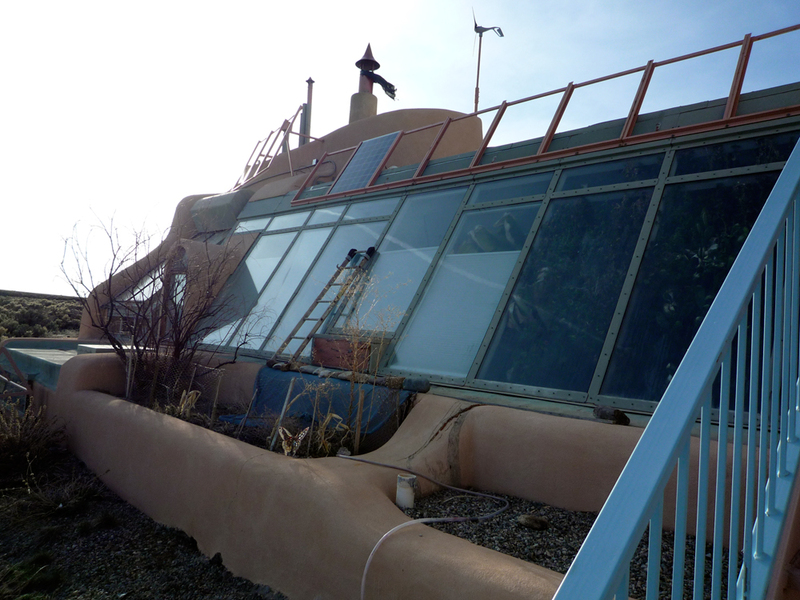 This calculated greenhouse heating along with the thermal mass of the rammed-earth tires keep the Earthships a relatively constant temperature year-round without the need for powered heating and cooling systems. 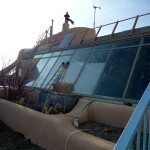 The sun also provides electricity for the Earthships through the use of photovoltaic solar panels. The panels (often combined with homemade Chispito wind turbines) generate DC power that’s stored in an array of deep-cycle batteries on the roof of the structure. The battery power is converted to AC for use within the home by a prefabricated power module provided by Earthship Biotecture. The wiring inside the home is just like that of a normal home, complete with a panel and circuit breakers, so standard lights and appliances can be used. Reportedly, the annual utilities bill for an Earthship is about $100 in propane for the stove. 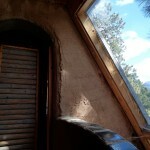 Water is the most precious commodity on an Earthship and is cleverly re-used several times in the design. The roof of the home is designed to channel rain, snow and condensation into a large 6,000-gallon cistern. From there, the water is sent through a series of filters to make the water suitable for drinking and cooking. Discarded water from the sink, called greywater, is sent through internal plant beds placed along the south wall housing decorative and food-producing plants. The greywater is collected at the end of the plant beds and re-used again in the toilets, with the help of a pressure pump. Finally, the flushed water from the toilet is sent to a solar-accelerated septic tank to be broken down and sent either to external planter beds or a traditional leach field. 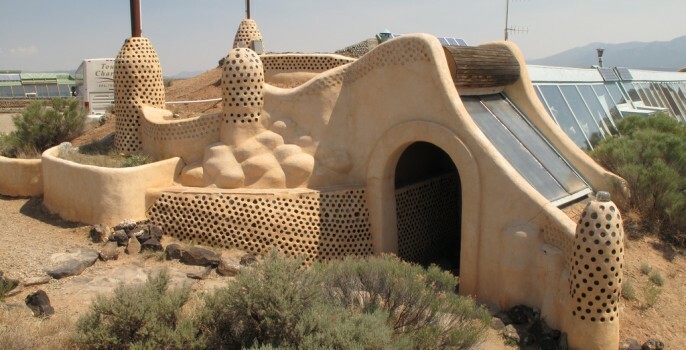 The styles of Earthships range greatly from modern and sleek to the more common far-out hippie designs. Commonly, non-structural walls are constructed with the help of ‘glass bricks’ – recycled bottles that are cut and taped together before being sealed in concrete. The light shining through these bottle walls creates a beautiful, artistic impression similar to stained glass. 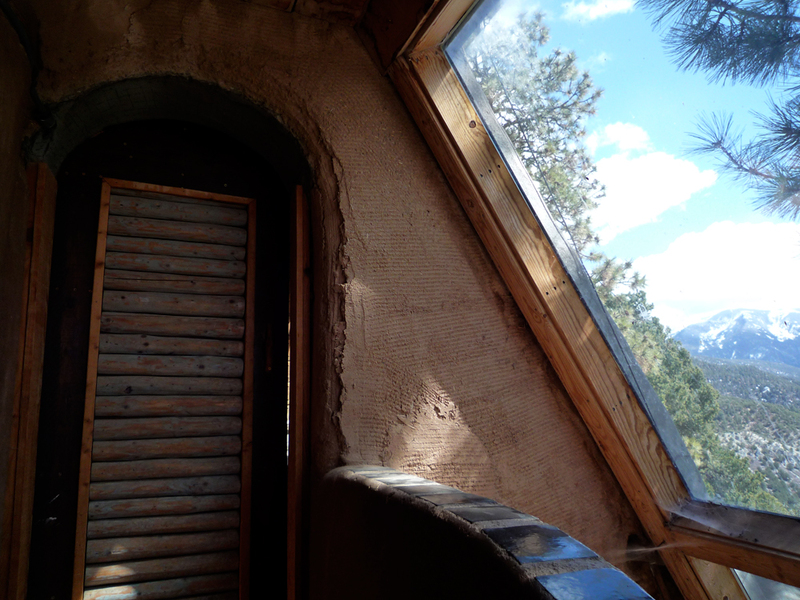 The other walls are thickly plastered with stucco, paying homage to the Earthship’s New Mexico roots. The What is Waste site has a quick video interview with Mike Reynolds that gives a great overview of Earthships. To learn more, check out the Earthship Biotecture site, find them on Facebook, or check out the informative Earthship YouTube channel. Flickr image credits: Cover image by Cecilia. P1020513 by Jessica Reeder. 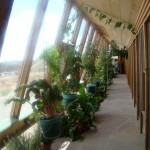 Plants inside the Earthship by J. Burton. Untitled by Cecilia. 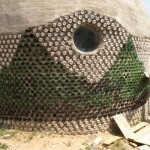 Cool Earthships by littlemoresunshine. P1020736 by Jessica Reeder. My husband and I will be taking a small group on a journey inward from Oct 11-24. 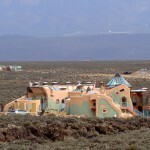 We will be staying in these very earthships! There are two spaces left if you are interested, you can e-amil me and I will give you more details.